Last night I went to my first Book Discussion group meeting at our local library. The book we discussed was The Language of Flowers by Vanessa Diffenbaugh. The story is the journey of Victoria her struggles as a child in a foster care system, the loneliness, the pain she suffers, her love of life, and her unique way to communicate with the world. After years of pain and hurt - how caring and loving people are helping her to accept who she is and why she does matter. Victoria's gift at sharing the powers of flowers leads the book through her journeys. Vanessa Diffenbaugh did a fantastic job of alternation chapters from current to past. I felt her alternating the chapters allowed me to understand and feel Victoria's pain and happiness. I was unable to put the book down - I keep wondering what could of happened to change so much for her. What happened to Elizabeth? Why was she gone from Victoria's life? Would Victoria ever realize that she mattered? I really liked the book and I would give it a MUST READ RATING. Are you wondering why I joined a book discussion group? I review books all the time - authors find me. So why would I join a group to discuss books? Well ~~~~ This summer at a family reunion my uncle told me how he belongs to his local library Book Discussion Group. He stated the one reason he really liked the book discussion group is because he is reading books that he would not normally pick to read. He also told me that he really enjoys being able to discuss a book. After each meeting he was able to find something that he missed or a different way to look at what happened in the book. After our discussion I went online and checked out our local library. Sure enough they have a Book Discussion group that meets the 1st Thursday of each month at 6:30 pm. I put the date on my calendar - found out which book they were going to discuss and started reading. I arrived and I was happy to see that I was not the first person there. I joined a group of 11 ladies that were there for the discussion. I felt that the group had a very good discussion about the book. We talked about different sections of the book - how Victoria felt and why things seem to have happened. We discussed our lives and how we could relate to incidents in Victoria's life. 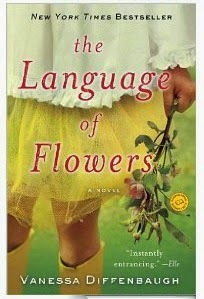 The Community Library Book Discussion Group gave The Language of Flowers by Vanessa Diffenbaugh a 3 MUST READ! Yes, I will be going to the group each month. I really enjoyed the book discussion. The ladies were all very friendly and I felt welcomed. We all had one thing in common - we read the book! If you LOVE to read and are looking for a fun way to share what you read. Check out your local library to see if they also have a Book Discussion Group. Don't worry about being new or not knowing anyone. Because even if you know no one in the group - you have something in common with everyone there! THE BOOK! What is the name of the best book you have ever read? Catcher in the Rye is my all time favorite book. I have read it about 20 times and it never gets old. Barb it was fun meeting you. If you ever want to do a guest post about being green or a book review - let me know. I am always looking for new ways to save our earth and be chemical free. Absolutely will keep it in mind! One of my passions in life is cooking from scratch with as much local and/or organic ingredients as possible. Sometimes I feel like I spend my life preparing food, but it is so worth it. (And now I am raising 3 little foodies because of it!) I love talking anything green and look forward to visiting more in the future. And yes, I do enjoy reading as much as possible. Our main focus in educating our kids is facilitating a lifestyle that focuses on learning through everything we do...which includes LOTS of reading. My favorite book still after many of years is Gone With the Wind. I started reading this book in high school and ended up getting the Cliff Notes because it was too long and boring for me LOL. I loved The Language of Flowers! My favorite books of all time are Catcher in the Rye and The World According to Garp. This sounds like a great book, thanks for sharing. I will add it to my must read list. The best book i have ever read and I am still reading is the Bible :), this sounds like a good book to curl on the couch with - glad you enjoyed it! Oh my gosh, it would be SO hard to pick a favorite book because I love so many of them!! I'm putting this on my reading list - it sounds really good! I can't wait to read this! I love books that go deep into someone's pain and explain the why/when/what about it. So very enthralling. I have to admit, I don't have a super ultimate favorite book of all time. I ADORE reading...... but "Sarah's Key" was pretty gripping. I think a book club would be so much fun. This sounds like an interesting book too! I know! I would love to join a book club too! This sounds like a wonderful book and one that I will be adding to my reading list! I would have to say my favorite book i ever read would be the Flowers in The Attic series. I read them as a teenager and the story has stuck with me. Although there are many wonderful books that I have read, I still think "Their Eyes were Watching God" is one of the best books I have ever read. Zora Neale Hurston is the author. I hate that it was ever made into a movie - that mess ruined the whole allure of the book. I'm always on the lookout for new books to read and this sounds like a good one! My favorite books are It by Stephen King and the entire Flowers In The Attic series by VC Andrews. I love to read and am constantly reading something new, but those remain my favorites after many years. This actually sounds like a great read and something that might tug on my heartstrings! I'm considering adding it to my reading list! I think book groups are so fun! I just saw that our library implemented a group for teens now. I want to sign my girls up as they are avid readers and I think they would enjoy it. I couldn't possibly pick the best book I've every read. There are just way too many good ones out there! Sounds like a good read! I'm always looking for engaging books to add to my reading list. Thanks! The best book I ever read was the Bible. I learn Something new each time I read it. I miss my old book club, it forced me to read a book each month. I need ot start another one thanks for the encouragement. The Language of Flowers sounds like a book I would enjoy. I would love to join a book club sometime. I would love to join a book reading club. I think it would be so fun and give me something to look forward to in my quiet time! I will for sure check out this book too! Sounds like a good read. I wish I was in a book club! I recently read Gone Girl, loved it, couldn't put it down. I love a book that keeps my attention. This sounds like a great read, thanks for sharing it. This sounds like a great book. I really need to join another book club. I read this book for my book club months ago and really loved it! I agree that book club is a great way to find books you never would have picked out for yourself. That title sounds familiar. I haven't been in a book club in ages... Good reading choice. Les Miserables is one of the best books. it is 1400 pages so I haven't read it a ton of times lol, but I still love it. I wonder if our library has a book discussion group. I think it would be fun to join one, or at least sit in on once in awhile. My favorite book I ever read would be where the red fern grows. I have my son reading it right now!! This sounds like a good one. I am such a big reader- it's hard for me to pick one!